The UK's first new standalone national newspaper in three decades is going to press tonight. 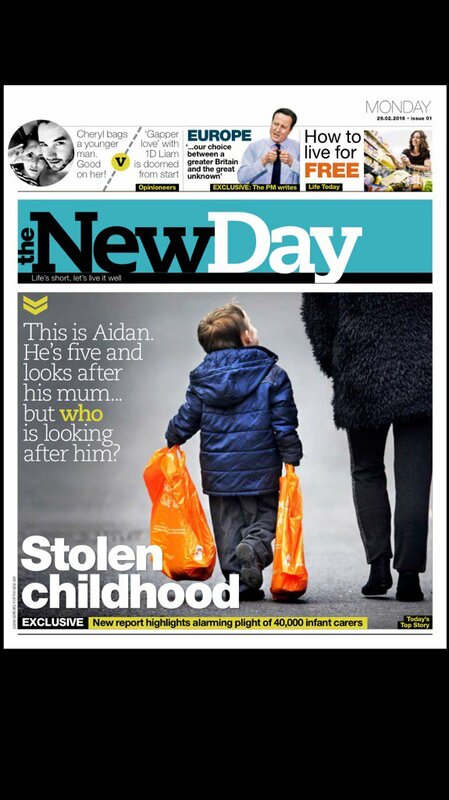 Monday's first ever edition of The New Day featured a front page with the headline "Stolen childhood" on a story about infant carers. Tomorrow's copy is being handed out free, while the paper will trial at 25p for two weeks before selling for 50p after that. Readers tomorrow can also peruse a comment piece written by Prime Minister David Cameron and another on the relationship between Cheryl Fernandez-Versini and One Direction's Liam Payne. Barry Rabbetts, the paper's executive editor, tweeted a copy of tomorrow's front page saying he was "delighted" for the people who helped get the newspaper off the ground. Publisher Trinity Mirror announced the paper's launch on February 22, shortly after it was announced The Independent and The Independent On Sunday newspapers would close and go digital-only. Trinity Mirror said The New Day "will cover important stories in a balanced way, without telling the reader what to think." Want to break into journalism? Here's your chance!